The last neighbors, strangers, and friends had just left Pancake Mondays at Patrick’s apartment when another neighbor knocked to say thank you for the invitation we left on his door. Ted had lived across the hall from Patrick for 6 months, but they had still never met. 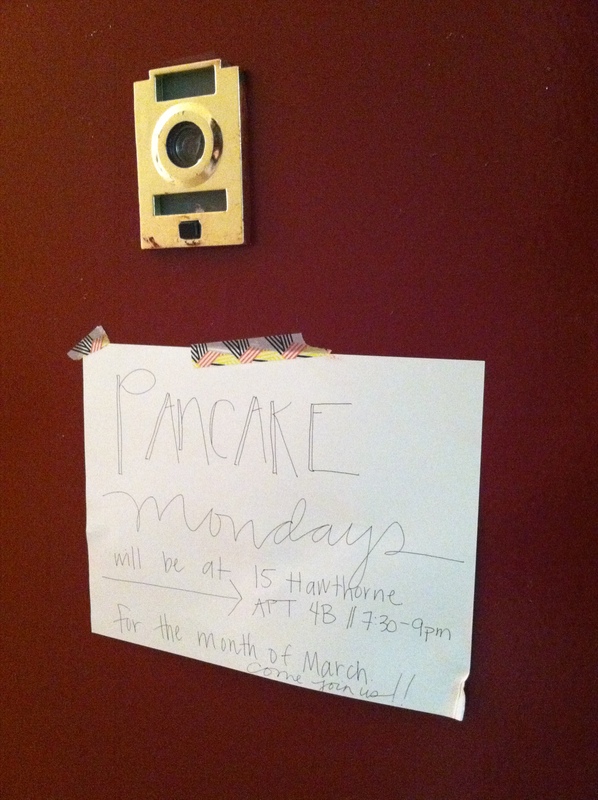 For some unfortunate reasons, we have moved the Pancake Mondays operation to Patrick’s apartment for the month of March. And (are we surprised?) what appeared to be every bit evil, God has turned into every bit good. Patrick and I both have griddles now and the ingredients float between our apartments as we host neighbors, strangers, and friends for pancakes and waffles and bacon. Last night, we all sat on armchairs and stools and leaned against the wall with criss-crossed legs on wood floors. 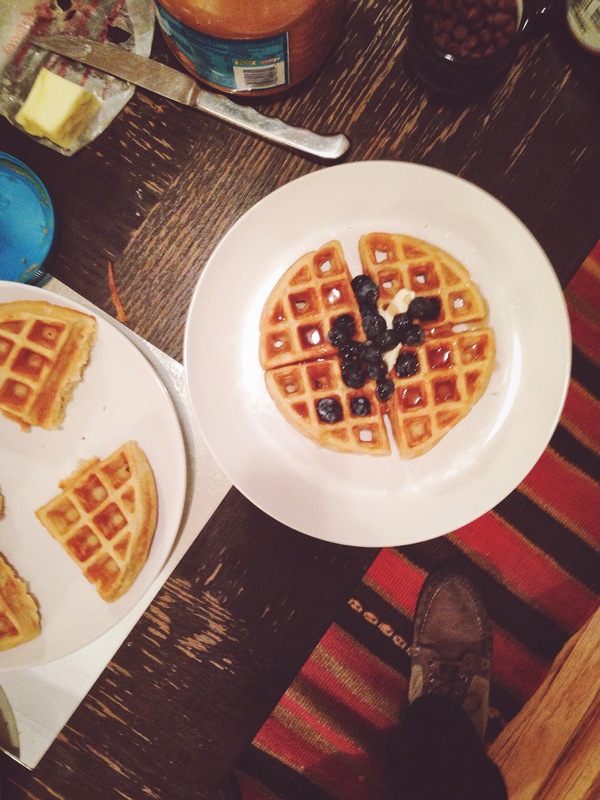 Tam took drink orders and I flipped waffles in the kitchen and Patrick taste-tested until we got the recipe and timing just right (wafflemaker courtesy of my favorite neighbor-friend Yeun). Everything about Monday night was just the right amount. Laughter, conversation, neighbors, and friendly banter. Good, old-fashioned neighborhood love was happening around a coffee table stacked with waffles, coconut jam, peanut butter, raspberry jam, coconut, syrup, and chocolate chips. I think we tripled a cinnamon vanilla waffle batch and served 13 people in all. I saw several neighbors as I was taping up invites and those who had plans asked if there would be a repeat the following week. “Yes!” is fun to say when it means more pancakes and neighbors and crowded living rooms. I kept wandering into the kitchen to let out excited squeals and Patrick kept following me to match my joy because community was happening in the other room. It’s like we uncovered a secret that God has already spoken so plainly: the love Christ has lavished on us is meant to be lavished on others. So, we crack the door open, mix up some batter, and trust His love won’t run out. This entry was posted in cooking and baking, lessons learned, Life Insight, Mondays, this is me, Thoughts. Tagged Christian community, Christian life, Christian love, Christianity, community, neighborhood, neighbors, pancake mondays, pancakes.